This place is small, be prepared to wait. Got a large group? Good luck with that. Chairs not exactly comfortable, need new padding. Service is pleasant but slow and spotty. Don't be in a rush. Menu online doesn't seem to be current. This restaurant used to be called La Condesa Cafe. La Santisima is a casual eatery serving a different kind of Mexican fare, using fresh, local produce combined with Mexican spices, peppers and cheeses that you'd find in Mexico (as opposed to the kind you'd find at local Mexican chain restaurants). I visited the location in Phoenix on 16th Street. The environment is colorful and cramped, but pleasant. You feel lie you're going to eat something special here. There is a small bar where you can also order food. We started with the homemade guacamole ($5). It was very fruity -- so much so that I found myself searching to pick out pieces of avocado. It was more of a fruit/avocado relish than an appetizer, IMO. The menu consist mostly of tacos, burros and quesadillas. I ordered the Oaxaca Black Molé Chicken Shark Taco (they had me at the word molé). This was the first time that I had ever eaten a taco with a fork and a knife. The focus here is more on the mole than the chicken, but very tasty. Not enough for a meal, but again, it is just a taco ($5). I also ordered the Pastor Queso ($10). That's pork. Don't expect the kind of quesadilla that you'd get at Macayo's or Garcia's. Think more calzone! It was huge, suitable for sharing; I took half of it home. Although I expected it to be spicy, I didn't find it so. It was served with more fruity guac, as shown in the photo above, so ask about that first if you are going to order the guacamole as an appetizer. The Guacho Burro ($9) had an adequate amount of meat along with fresh veggies and greens. The horchata with strawberries and pecans was a popular item around the room, so I ordered one. I never received it. We looked forward to ordering the flan for dessert, but they were out. While my experience wasn't perfect, I would return to La Santisima, and experiment until I found those two or three items that I'll order every time I go. The prices are certainly reasonable and the food is fresh. It is a welcome change from the ordinary. 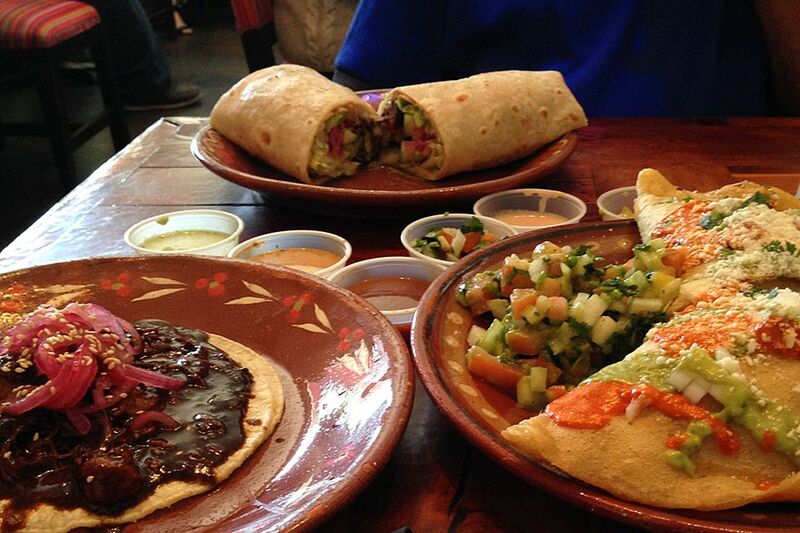 La Santisima is open for lunch and dinner seven days per week. Free parking available. Find La Santisima on a map. All dates, times, prices and offerings are subject to change without notice. May 2015. Gourmet Food From Kitchens on Wheels. It's Street Eats in Scottsdale!